We just spent 2 weeks successfully boondocking (dry camping without hookups) in our factory equipped RV in Quartzsite, Arizona No, we don’t have solar…yet! 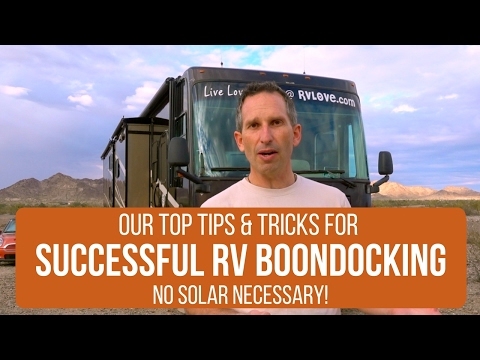 Successful boondocking takes a bit of advance preparation and you need to be extra mindful of conserving water and power. In this video, we share some of our top tips and tricks for how we do it and what works well for us. Check our pages for regular updates. *This is a small way to help keep our channel going that doesn’t cost you any extra. All purchases are private. Our in-depth reviews of the gear we use and love in our RV and traveling life. *This channel for entertainment purposes only. We are not RV, travel or renovation experts. We share our opinions based on our experience and what works for us, but you should do your own research. * Using our links supports us in continuing to create free content for you.